There is nothing as soul cleansing as bebop. Period. When you couple the music with the sunshine of Los Angeles (OK, when the smog has cleared) there is a medicinal, tonic effect to be had. 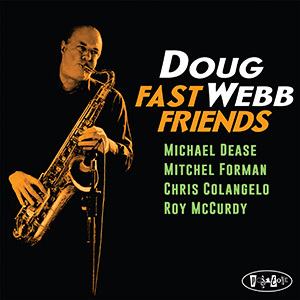 Enter L.A. session saxophonist Doug Webb, a contributor to film and television, and member of big bands led by Bill Holman, Doc Severinsen, and Don Menza. Fast Friends is his eighth release for Positone. His previous disc, Bright Side (2016) featured trumpeter Joe Magnarelli, guitarist Ed Cherry and organist Brian Charette. Before that there were sessions with saxophonists Walt Weiskopf and Joel Frahm, and Stanley Clarke, Larry Goldings, and Rudy Royston, to name just a few. The above names attest to the attraction Webb’s sound and sessions produce. Since this recording emanates from California—Pasadena, to be exact—you might suppose the traditional West Coast Coolness. That’s not what you get. Think Dexter Gordon, Wardell Gray, Buddy Collette, and Frank Morgan, all under the influence of Charlie Parker‘s 1947 California road trip as a reference for Webb’s music. The saxophonist power-washes several standards and some original music with the help of trombonist Michael Dease, pianist Mitchel Forman, bassist Chris Colangelo and legendary drummer Roy McCurdy. Webb’s “Last Train To Georgia,” with flavors of “Sweet Georgia Brown,” opens the disc with Webb and Dease interweaving horns before each player, including Forman, deliver condensed yet quicksilver solos. The music shows great attention to detail, with fastidious swing and economical solos throughout. Hank Mobley‘s “High Groove, Low Feedback,” from his early Blue Note recordings, gets the royal treatment with Webb soloing cucumber cool, that is, hot. Same for Dizzy Gillespie‘s warhorse “A Night In Tunisia” delivered briskly, and with all due respect. Webb though, isn’t (as they say) just another pretty (blowing) face. He canoodles the Jule Styne composition “The Things We Did Last Summer,” prompting a memory of Sammy Cahn’s lyrics with help from Forman. The two standout tracks here are Charlie Parker’s “Ah-Leu-Cha,” elegantly arranged as a dance between saxophone and trombone, and “Nopoló,” a big-shoulders barn-burning blues that each member digs into with both hands and feet.